Prime Minister Malcolm Turnbull will invite a leadership “spill” motion at midday Friday, once a majority of Liberals formally ask for a party meeting. He will not contest the subsequent ballot if – as anticipated – the spill is carried, Turnbull announced to a lunchtime Thursday news conference. Before the meeting, the Solicitor-General on Friday will provide an opinion on the constitutional eligibility to sit in parliament of challenger Peter Dutton. Early Thursday afternoon, the final signatures for the party meeting request were being gathered. The delay and the early provision of the Solicitor-General’s advice give Treasurer Scott Morrison extra opportunity to build support for his own bid for the leadership as an alternative to Dutton. After a morning of chaos and multiple ministerial resignations, including that of Senate leader Mathias Cormann, Turnbull told his news conference that if he is ousted he will quit parliament – increasing the prospect of an early election. He said he had “made it very clear that I believe former prime ministers are best out of the parliament”. The government has a one seat of majority and his seat of Wentworth, although it has a strong margin, would be vulnerable in a byelection because Turnbull is personally very popular there. A byelection would not be needed if there were an early election. Turnbull said that assuming the spill was carried, the new prime minister would “have to obviously satisfy the Governor-General that they can command a majority on the floor of the House of Representatives. Turnbull delivered a swingeing attack on those who have undermined him. “A minority in the party room, supported by others outside the parliament, have sought to bully, intimidate others into making this change of leadership that they’re seeking. “It’s been described by many people, including those who feel they cannot resist it as a form of madness,” he said. Turnbull has been under consistent assault not only from Tony Abbott and other Liberal critics over a range of issues, especially energy policy and immigration, but also from commentators in the Newscorp media, especially on Sky, and from shock jocks on 2GB. Stressing how vital it was to resolve the issue of Dutton’s eligibility, he said: “This is a very, very significant point. As we all know, section 44 has been a companion of this 45th parliament. Legal experts suggest Dutton could be ineligible under the constitution’s section 44 provision on pecuniary interests. This says a person is incapable of sitting if they have “any direct or indirect pecuniary interest in any agreement with the Public Service of the Commonwealth”. Dutton through a family trust has an interest in child care centres that receive Commonwealth funding. The key question is whether this involves an agreement with the public service. Dutton’s legal advice is that he has no constitutional problem, and on Thursday he issued updated legal advice. The government shut down the House of Representatives but does not command the numbers in the Senate so had to endure question time with senior ministers who had resigned on the backbench. Liberal deputy and Foreign Minister Julie Bishop will throw her hat into the leadership ring. Bishop, from Western Australia, has been deputy Liberal leader since 2007 under multiple leaders. She is a moderate, rates well in the opinion polls, and has a high profile internationally as well as locally. She is in much demand from backbenchers to visit their seats and is a good fund raiser. But she will go into the ballot with the disadvantage of having made many enemies in a long political history. Her entry into the field complicates the situation and makes the outcome even less certain. The government has been forced to put off a vote on its tax cut for big business after failing to secure support from the final two crossbenchers it needs to pass the legislation. The deferral until the budget session in May is a bitter disappointment for the government, which had been hopeful of landing the legislation this week. It needs nine of the 11 non-Green crossbenchers to pass legislation. It had seven on side but still needed Victorian senator Derryn Hinch and South Australian independent senator Tim Storer. Hinch has most recently been talking to the government about trade-offs in the areas of help for pensioners, affordable housing, assistance for the older unemployed, and more action to combat paedophilia. One source said Storer’s inexperience – he only arrived in the Senate last week – was a complication in finalising negotiations. Storer said lower company tax should be part of broader tax reform. “This bill is a narrowly cast proposition of change to the overall tax and transfer system”, he said. The legislation is for the second tranche of the tax cuts, which is directed for big business. It would cost the budget A$35.6 billion, apply to companies with turnovers of more than $50 million annually, and bring the rate for them down from 30% to 25% by 2026-27. Finance Minister Mathias Cormann told the Senate late on Tuesday that the legislation would not be debated further this week. “It is a matter of public record that, as a result of the work that has gone so far, we have been able to secure the publicly stated support of 37 senators in this chamber for our business tax cuts legislation,” he said. He said the government thought it could get the numbers and so was “committed to keep working, to keep engaging”. Cormann said the government intended to bring the legislation back to the Senate in the next sitting week – which is budget week. Speaking to a function organised by the Business Council of Australia (BCA) at Parliament House, Malcolm Turnbull said the government was still two votes short and encouraged the businesspeople to keep talking to the crossbench. He said the government wasn’t fighting for higher dividends or higher remuneration for executives but to give companies every incentive to invest and grow, creating more jobs and higher-paid jobs. 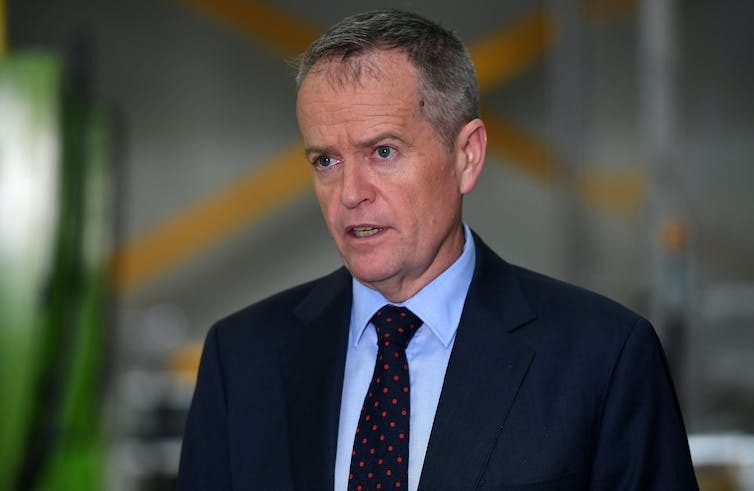 Earlier on Tuesday, Opposition Leader Bill Shorten pledged a Labor government would repeal the legislation if it passed. He said the opposition would decide its position on the tax cuts already passed for businesses with annual turnovers up to $50 million “in the context of the information we receive in the budget”. The case for the tax cuts received a setback on Tuesday with the reporting of a secret BCA survey finding that fewer than one in five of leading chief executives had said they would use the proposed cut to directly increase wages or employ more staff. The Australian Financial Review reported that “more than 80% said they would either use the proceeds to boost returns to shareholders or invest in the company”. The BCA played down the survey, saying it had never been finished. Last week, the BCA released a letter signed by ten business leaders, saying: “If the Senate passes this important legislation we, as some of the nation’s largest employers, commit to invest more in Australia which will lead to employing more Australians and therefore stronger wage growth as the tax cut takes effect”. The Australia Institute, lobbying against the legislation, wrote to senators with a brief about reaction to the Trump cuts. “Critically, the evidence shows it is not workers and employees who are benefiting most from the tax cuts. In fact, the tax cuts will exacerbate inequality with benefits flowing overwhelmingly to wealthier Americans via, for example, share buy-backs,” the institute’s executive director, Ben Oquist, wrote. Bill Shorten will seek to elevate the issue of a republic by pledging. a policy for quick action. A Shorten government would ask voters in its first term whether they supported Australia becoming a republic. that “by the end of our first term, we will put a simple, straightforward question to the people of Australia: Do you support an Australian republic with an Australian head of state? He will say that in a Labor government a minister would be given direct responsibility for advancing the debate. The Shorten policy for quick action on a republic contrasts with Malcolm Turnbull’s position, which is that the public will not want the issue back on the agenda until after the Queen’s reign ends. Labor’s two-stage process – with the first stage a general plebiscite question about wanting a republic, followed by a referendum which would incorporate a model – is designed to maximise the chances of support. But the issue of the model and the requirements of a referendum – which needs an overall majority and a majority of states to pass – would still remain the difficult hurdle. The 1999 unsuccessful referendum proposed the president of the republic be chosen by parliament, but it is likely that these days people would want a directly elected president – a model that raises more issues. Shorten will say in his speech: “We cannot risk being caught in a referendum like the last one, where Australians were given one vote to settle two questions. When a lot of people voted ‘no’ because of the model, not because of the republic. He will say he is confident that if Australia became a republic, “Queen Elizabeth would farewell us with the same affection and good grace she has shown every time a Commonwealth nation has made the decision to cut its ties with the monarchy. Shorten will acknowledge that the republic issue “isn’t front of mind of everyone, but I don’t buy the argument that we can’t have this debate until every other problem in the nation has been solved. “In these fractious times, governments age quickly and lead short lives. The Coalition has slipped further behind in Newspoll, trailing Labor 47-53% in two-party terms, despite a pragmatic budget that moved the government onto ALP ground in a bid to win back voters. Labor slightly widened the gap compared with three weeks ago when it led 52-48%. This makes a dozen Newspolls in a row that have seen the government behind the opposition. The post-budget Fairfax-Ipsos poll also has Labor ahead 53-47%. The previous Ipsos poll was in late March, when the ALP led 55-45%. Both polls show majority support for the budget’s tax increases – the new bank tax and the proposed hike in the Medicare levy. The bank tax was backed by 68% in each poll; the Medicare levy rise was supported by 54% in Newspoll and 61% in Ipsos. In the Ipsos poll, one in two people said they would be worse off from the budget; only one in five believed they would be better off. In Newspoll 45% thought they would be worse off and 19% said they would be better off. In both polls, Coalition voters were more likely than Labor voters to think they would be better off. In Ipsos people were evenly split on whether they were satisfied with the budget – 44% were and 43% were not, a net plus one. This is better than the response to last year’s budget (minus seven) but not as good as the reception for the 2015 Hockey budget (plus 17). Ipsos found 42% thought the budget fair, compared with 39% who did not, a net plus three. Last year’s budget rated a net minus six on fairness. Coalition voters were more likely than Labor voters to rate the budget as fair – 63% to 25%. Newspoll asked whether it was fairer than previous budgets delivered by this government: 39% thought it was, while 36% did not. Labor’s primary vote in Newspoll, published in The Australian, is up a point to 36%; the Coalition is static on 36%. The Greens rose a point to 10% and One Nation fell a point to 9%. The poll was taken from Thursday to Sunday. When budgets do not normally bring a bounce for a government – ministers will argue it will take time for positives to show up in the polls – the result will be a disappointment for Malcolm Turnbull, although his personal ratings have improved. In Newspoll, his net satisfaction went from minus 25 points to minus 20 points in three weeks, while satisfaction with Opposition Leader Bill Shorten declined from minus 20 to minus 22. Turnbull has also widened his lead as better prime minister from nine to 13 points – he is now ahead 44-31%. The Ipsos poll found the government’s promised A$18.6 billion boost to spending on schools was supported overwhelmingly – by 86%. Some 58% backed increasing national debt to build infrastructure, but 37% opposed. Treasurer Scott Morrison on Sunday continued his tough language on the big banks, which are furious about the new tax imposed on them.